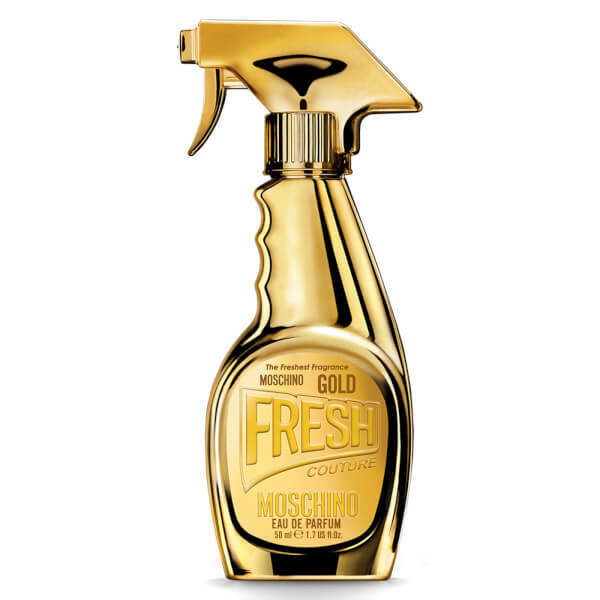 Discover Moschino Gold Fresh Couture; a floral, fruity and woody perfume presented in creative, unique packaging. 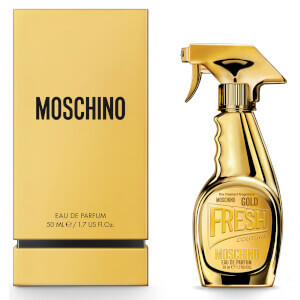 Opening with striking notes of fresh Mandarin, Pear and exquisite White Vine Peach, the playful fragrance is enhanced by a floral heart of Jasmine, Lily of the Valley and Golden Chain Orchid, before settling on a sensual dry-down blended from Sandalwood, Musk and creamy Vanilla. Housed in a quirky cleaning spray-inspired bottle and gold-toned gift box. Top Notes: Grapefruit, Mandarin, Pear, White Peach, Rhubarb. Heart Notes: Jasmine, Lily of the Valley, Golden Chain Orchid (Scenttrek®). Base Notes: Sandalwood, Musk, Vanilla, Akigalawood. Like any fragrance, apply one or two sprays around your neck and on your pulse points (areas where the body is warmer, such as the wrists, ankles, inside the elbows and behind the knees) from a minimum distance of 15cm, then allow to dry without rubbing.